Recent graduates of CFHE’s Determined to Dominate Diabetes program. CVS Health Foundation has partnered with the National Association of Free & Charitable Clinics (NAFC) on a multi-year program, awarding grants to increase access to care, improve health outcomes and lower overall health-care costs across the country. Among the 2018 NAFC grant recipients is the Center for Family Health & Education (CFHE), a Los Angeles, California-based clinic that opened in 2009. Located in the Panorama City neighborhood of Los Angeles, an area with high rates of diabetes, heart problems, hypertension and high cholesterol, CFHE serves more than 20,000 low-income, diverse patients and families with no or limited health insurance coverage each year. Services include primary health care, mental health care, dental care, and women’s and children’s health care, as well as transportation services. 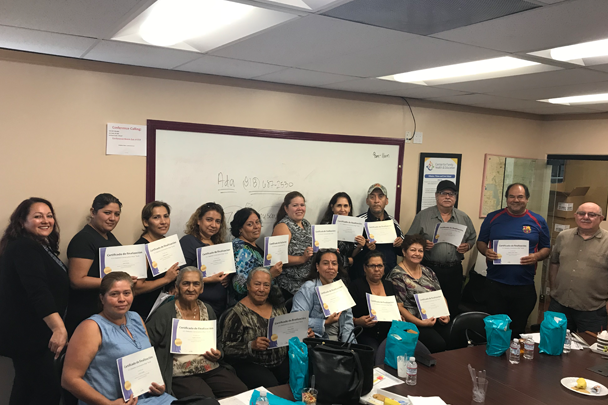 CFHE works with community organizations to provide health education programs in the community, including smoking cessation, liver health and nutrition workshops. These programs are designed to promote disease prevention and overall health wellness among all patients, particularly those with chronic diseases like diabetes, cancer and heart problems. The CVS Health grant supports Determined to Dominate Diabetes (DDD), a 12-week obesity, pre-diabetes and diabetes English- and Spanish-language education program. The first four-week group class focuses on the Conversation Map, a patient-centered, innovative tool for diabetes education developed in collaboration with the American Diabetes Association. Participants that complete the first four weeks move into the second and final phase of the program, which includes a 20-minute, one-on-one, weekly accountability appointment with a registered dietician. During this time, participants are also enrolled at a local gym and weighed weekly. Topics covered throughout the program include diabetes management, healthy eating, blood glucose monitoring and gestational diabetes management. DDD has had a high rate of success. Program participants are achieving weight loss and lowered blood sugar levels through lifestyle changes taught and encouraged through the DDD program. Participants report enjoying the lectures by CFHE’s registered dietician and the other content provided through the program. Holding group sessions, both at the clinic and a local public grade school, has enabled CFHE to reach more residents to participate in DDD. The group class brings participants together in a friendly, open environment and helps them feel personally involved in the learning process. Through the class, participants discover solutions and use their newfound knowledge to make positive lifestyle changes.